The photographs that have added meaning to my notes,are courtesy to various photographers, who shared their work openly on the web.Being the authoress of the blog, I have tried to avoid infringement of any copyright of the photographs that i've applied , but, if by any chance it has happened then i hope that the copyright holder will accept my apology. A lot has changed since I started blogging. Earlier, I used to believe that things that I write, happen with me only. I am the only one under this wide open sky, who feels the pain, gets nostalgic and understands how it is like being in love. But, over the time, I have learned so much. I have seen people going through the same pain that I have experienced at some point of time. Everyone has met the most memorable people in their lives, everyone has lost someone they love the most and everyone has seen the dark days of lonliness. It's just that everyone has a different way of expressing it. Earlier my blog was all about emotional stuff, then it grew up and starting exploring different expressions. Today a friend of mine asked me that why don't I blog these days. However, life has been strict about all the time that I had stolen from it and she wants it back, so I am a bit busy paying it off. But thanks to the stubborn side of mine that I have again managed to steal some time and scribble few pointless yet beautiful thoughts here in my blog space. So, what should I talk about...Hmmm, I can't think of anything but nostalgia, which hits me rarely nowadays. Yes, I read it somewhere that nostalgia is a state of mind, which makes you believe that the time went by was much better than is actually was. Anyways, whatever it is, but this nostalgia thing has been really close to my heart. I sometimes think of the good old days, which I spent with people, who are altogether different individuals right now. I don't recogize them and cannot relate to them with what they were few years back. I guess they have changed or may be it is me, who has become altogether a different person. But still, I have managed to keep a tiny space secured in my heart, where all those memories hide that belong to a delightful nostalgic life of mine. The days, when few close friends, one hostel room and backstreet boys songs were enough to make life perfect. Sharing one of the numbers that still manages to ignite the feeling of nostalgia in my busy heart...Cheers to Good Old Days! Get back to good old days then. I too like the song. 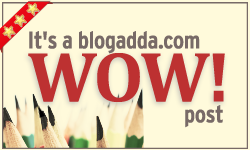 BlogAdda is back with another interesting activity #WillYouShave I have tagged you here. Kindly accept my tag and have fun writing! ©Priyanka. Watermark theme. Theme images by dem10. Powered by Blogger.